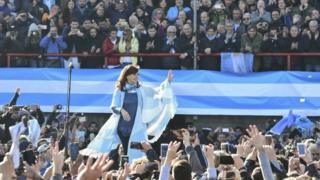 Tens of thousands of people cheered former Argentine President Cristina Fernández de Kirchner in Buenos Aires on Tuesday. Ms Fernández, 64, launched a new political party, Citizen's Union, ahead of legislative elections on 22 October. The move has triggered speculation that she will run for a senate seat in the midterm poll. The ex-president has until Saturday to decide. Supporters shouted "Cristina for senator!". One-hundred-and-twenty-seven seats in the Chamber of Deputies and 24 in the Senate will be up for election. Ms Fernández governed from December 2007 until December 2015, when Mauricio Macri defeated the candidate she backed. Since leaving office, Ms Fernández has been a vocal critic of President Macri and his pro-business policies, in particular budget cuts. She has also been battling corruption charges. She is under investigation in connection with three different corruption cases and faces trial over alleged financial mismanagement during her time in office. Ms Fernández says the charges against her are politically motivated. It had been widely expected that she would reveal at Tuesday's event whether she would return to front-line politics, but despite the cheers of her supporters, she would not be drawn. Saturday is the deadline to register for primaries due to be held on 13 August.